Originally posted on Perf Planet. Before we go into the implementation details it is important to get an overview of how React works. Replace attribute: className="first" by className="second"
Finding the minimal number of modifications between two arbitrary trees is a O(n4) problem. As you can imagine, this isn't tractable for our use case. React uses simple and yet powerful heuristics to find a very good approximation in O(n). 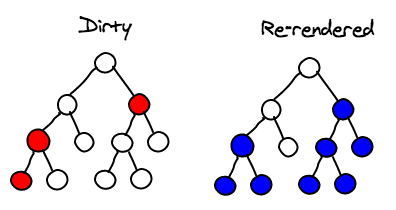 React only tries to reconcile trees level by level. This drastically reduces the complexity and isn't a big loss as it is very rare in web applications to have a component being moved to a different level in the tree. They usually only move laterally among children. Let say that we have a component that on one iteration renders 5 components and the next inserts a new component in the middle of the list. This would be really hard with just this information to know how to do the mapping between the two lists of components. By default, React associates the first component of the previous list with the first component of the next list, etc. You can provide a key attribute in order to help React figure out the mapping. In practice, this is usually easy to find out a unique key among the children. A React app is usually composed of many user defined components that eventually turns into a tree composed mainly of divs. This additional information is being taken into account by the diff algorithm as React will match only components with the same class. For example if a <Header> is replaced by an <ExampleBlock>, React will remove the header and create an example block. We don't need to spend precious time trying to match two components that are unlikely to have any resemblance. Attaching event listeners to DOM nodes is painfully slow and memory-consuming. Instead, React implements a popular technique called "event delegation". React goes even further and re-implements a W3C compliant event system. This means that Internet Explorer 8 event-handling bugs are a thing of the past and all the event names are consistent across browsers. Let me explain how it's implemented. A single event listener is attached to the root of the document. When an event is fired, the browser gives us the target DOM node. In order to propagate the event through the DOM hierarchy, React doesn't iterate on the virtual DOM hierarchy. Instead we use the fact that every React component has a unique id that encodes the hierarchy. We can use simple string manipulation to get the id of all the parents. By storing the events in a hash map, we found that it performed better than attaching them to the virtual DOM. Here is an example of what happens when an event is dispatched through the virtual DOM. The browser creates a new event object for each event and each listener. This has the nice property that you can keep a reference of the event object or even modify it. However, this means doing a high number of memory allocations. React at startup allocates a pool of those objects. 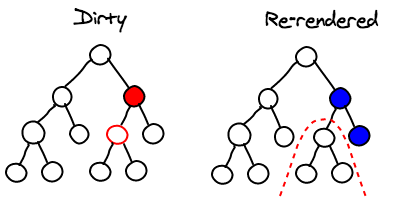 Whenever an event object is needed, it is reused from that pool. This dramatically reduces garbage collection. Whenever you call setState on a component, React will mark it as dirty. At the end of the event loop, React looks at all the dirty components and re-renders them. When setState is called, the component rebuilds the virtual DOM for its children. If you call setState on the root element, then the entire React app is re-rendered. All the components, even if they didn't change, will have their render method called. This may sound scary and inefficient but in practice, this works fine because we're not touching the actual DOM. 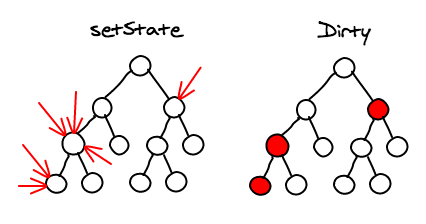 Another important point is that when writing React code, you usually don't call setState on the root node every time something changes. You call it on the component that received the change event or couple of components above. You very rarely go all the way to the top. This means that changes are localized to where the user interacts. based on the previous and next props/state of the component, you can tell React that this component did not change and it is not necessary to re-render it. When properly implemented, this can give you huge performance improvements. And you want to keep in mind that this function is going to be called all the time, so you want to make sure that it takes less time to compute that heuristic than the time it would have taken to render the component, even if re-rendering was not strictly needed. The performance cost model of React is also very simple to understand: every setState re-renders the whole sub-tree. 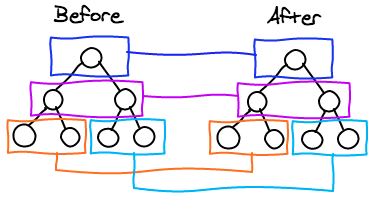 If you want to squeeze out performance, call setState as low as possible and use shouldComponentUpdate to prevent re-rendering an large sub-tree.